Six albums on and the Marcin Wasilewski Trio (originally known as Simple Acoustic Trio) have evolved into a relaxed, introspective and now adventuresome outfit. The trio's stint with Tomasz Stanko and some warm production work from Manfred Eicher of ECM have helped the group hone its sound as well as their performances. Their use of space is clever and precise and makes their latest album, Faithful, one of their best and one of JazzWrap best albums so far this year. Adventuresome is one of the aforementioned words I used to describe MWT's advancement. On the opening of Faithful, "An den kleinen Radioapparat", the group explore German composer Hans Eisler classical standard sans vocals. Without the vocals the listener is clearly focused on the instrumentation. And the delivery from Wasilewski is sublime. Miskiewicz's subtle brushes add a layer of mystery that still reflects upon the original composition. "Night Train To You," moves a with lovely but rapid pace. Wasilewski while setting the structure has written a piece that still allows the group to improvise throughout. One of the things I've always enjoyed with MWT's albums is their ability to reshape and re-imagine other artist's material. As evident on Paul Bley's "Big Foot" where by the very nature of the composition, the trio strive and deliver a powerful yet playful performance. Kurkiewicz's movements are dense and propulsive. Wasilewski's uptempo rhythms really give Bley's original a run for the money. It's one of the best versions of this piece I've heard (not that there are a whole lot). While on "Oz Guizos" (originally written by Hermeto Pascoal) the trio are wonderfully melodic and add a sense of spaciousness that gives the members wide breathing room. Kurkiewicz strumming is sublime and helps the piece move gently up and down. The delightful "Lugano Lake" closes the album and for me encapsulates the trio's recent form of the last few years. It's peaceful, agile and dynamic all the while holding a sense of mystery that many listeners will gravitate to. Marcin Wasilewski has emerged as a colourful and daring pianist in the last few years. The trio as a whole continue to solidify their name on the global psyche. 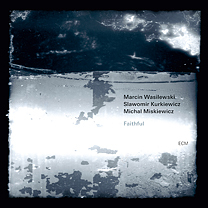 The diversity of Faithful may finally send the Marcin Wasilewski Trio into the next level of recognition. This is a brilliant piece of work from a group that gets better and better with every outing. Deep. Personal. Reflective. And Highly Recommended.